Wonderful information Ben.If you discussion something about HD connection delivering SD channel specially in India.How blurr in image can controlled or quality picture can be improved. But what if your cable provider only broadcasts in 720P. Why be concerned with 1080P? If you never watch content with a resolution higher than 720p, there is no need for a TV with any higher resolution. Future upgrades by the cable provider, or Blu-ray, would be the only possible reasons for 1080p. At any distance more than 8 feet the resolution of your eyes cannot distinguish the difference between 1080 or 720. You must be at least 8 feet or closer to see 1080 discreetly over 720.. I fully respect Carlton’s bio-calculations. He correlates eye-resolution with the subtended viewing angle. The calculation yields the minimum screen resolution needed to satisfy the eye, taking into account screen size, resolution & distance. But, I respectfully take issue with the suggestion that anyone should invest in a 60 inch television (or monitor) without getting 1080p. After all, the cost difference is negligible (wait a few days for a sale price. Full HD is consumer mainstream. Any difference is negligible). If the eye cannot see the difference at 10 feet, then you might ask “Why should I care?”. (c) You may choose to sell or repurpose the TV in a world filled with QHD (4K) appliances. Consider all of these reasons. I am certain that you can think of others. I agree, if the cost difference is negligible, go for higher resolution. With 4k, the price increase is currently a pretty substantial difference, and the benefit is probably not there for most viewers. I’d take a high-contrast OLED 1080P TV over a 4K LED TV any day. . .
4K (2160P) is simple. 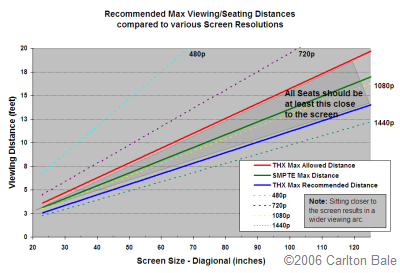 If you sit further away than the width of the screen; you have no chance what’s so ever, of benefiting from 4K . If your buying a 72″ (diagonal), which is 62.6″ wide you must sit closer than 62″ to it. When 4K hits your local cinema, sit in the first four rows and enjoy !?!? Yep, they think we’re stupid. But I hear the new 4K popcorn improves visual acuity. I love sending people (and journalists!) here when they start raving about 4K and 8K entering the home market. As I always said, in order to benefit from it, first of all you would have to live in a huge mansion that can actually accomodate a screen size and comfortable viewing distance at which you can even see the difference. Especially with eyesight as mediocre as my own. The calculator is great for bringing people back down to earth. With a 50″ screen, which I think is already at the very upper limit for most regular living rooms, “for 8k (7680×4320) resolution, you must sit 2 feet or closer for full benefit”. I don’t think that’s what many people would call a comfortable setting. There was a quote about half a year ago from an executive at Sony, nicely exposing it for the eyewash it was. I’m not sure whether this individual wanted to say it the way he did, or whether he’s since been fired for it =) but asked by the interviewer for the reasons why 4K and 8K are pushed into the consumer market at this point in time, he replied that the market for Full HD and 3D TVs is nearly saturated and sales are down. In other words: they just needed something, *anything* to make people feel like their HDTV is already outdated again and they should get a new one. A fantastic website by the way, this is not the first time I have ended up here. Is that home theatre in the background yours? Thanks Daniel. I agree, unless it’s a computer monitor, 4k and 8k are a waste. It’s funny that you mention Sony, because if you check out my similar post, it mentions the Sony 4K UHDTV product page confirming that very close seating distances are required. Kudos to the them for being so upfront about it. Too bad not every most other sources are not. Yes, that’s my home theater in the backgroud. It took a lot of work initially and we’ve spent a lot of time watching movies ever since. I saw a documentary talking to a Japanese TV station that has prototype 8k displays. They were of the opinion that 4k was pointless, and that 8k was the future, BUT, they were also of the opinion that 8k displays would be wall-sized (Their prototypes were all something like 16 feet across or more), and wouldn’t be used for regular TV/Film use, but rather displaying footage where there is a good reason to walk right up to the display and look at things from close up. (Eg, touching distance, or the kind of distances computer displays are used at). Katrina, that is definitely an interesting use of 8k resolution and is completely appropriate. I can see this type of display being very useful in a broadcast studio/news room. Years in the future, flexible OLED displays that could be unrolled and hung on the wall could make this a reality. Wish I could have found this article earlier…..was going crazy to buy a TV and as I hate big TVs and people were forcing me to buy a huge one because they kept saying there won’t be any difference in 1080i picture quality for a TV as 32″. But if I read right, then if I maintain 4 feet (and that’s for 1080p, I am talking about ‘i’) distance then I will be able to see the difference! I don’t see a point to get a 39 or 42″! Am I wrong? If anyone is still reading this kindly reply, I would be very grateful. Yes, i think you are right. Keeping the proper distance from the screen, there would be a good difference for 32 inch displays for 1080p. The 5 inch smartphone-phablets have full hd displays, so what’s wrong with having full hd in a 32 inch ? (also keeping in mind the pixel density). Yeah, I know, I have a S4, but you know people keep saying whatever they want! They kept saying there won’t be any noticeable difference for any screen size below 42″! What can I say? I think I am going for the 32″, maybe I could consider a 39″, but no way a 42″. Hi there! Great site full of useful informations. I actually didn’t get one thing: let’s say i have a 1080p 50-inches display, according to the calculator I should sit at least at 7 feet away to see a difference with a 720p monitor and at 6,5 to get the best out of it. Now, I don’t get why it says 7 feet “or closer”, should not be a lower limit at which you actually resolve pixels so you have to sit farther? Is this limit 6,5 for the given example? Finally, does the benefit increase going up with screen size? Thanks in advance, and again great job! I sit 11′ from my screen and it’s 123 inches. If im understanding this right, then (according to the screen calculator above) @110″ diagonal, 720p can be enjoyed from between 14-21 feet with almost little or no perceivable difference from 1080p. Is this right ? Viki, yes, that is correct. Little to no noticeable difference at viewing distances greater than 14 feet. Carlton, you are the man! Thanks for laying this out in an easily understandable manner. I love it…Thank you, Carlton! My admiration is a bit self serving. 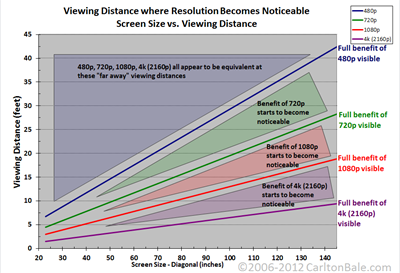 Your chart of screen size/viewing distance/resolution validates and ‘quantifies’ a claim that I have made at AWildDuck and LinkedIN forums. But, my assertion was subjective and not backed by the physiological data concerning the ability of the human eye to discriminate: a subtended angle of 1/60 degree. Great site. I am using a Sony 4k projector in a room that is 28 feet wide (screen wall) and 18 feet deep for seating. Would like to get two rows and the largest possible screen without having the front row to move their heads to watch the action. What is the widest screen size I can go with? Is 15 feet in 2:35 ration too wide if the front row were 15 feet away from screen? Avi, That’s an impressive setup! That screen size and viewing distance are fine as long as the projector is bright enough for a screen that big. The room will need to have total light control. From a resolution standpoint, you could even move the front row a bit closer, but I don’t see a huge need for that unless you needed more space in the back for the second row. FYI, if you’re using an anamorphic lens on a 16:9 projector, the resulting image aspect ratio will actually be 2.37:1 instead of the film standard of 2.35:1. If the screen is being custom made, I’d go for the 2.37:1 aspect ratio instead, but they are so close you’d be fine with either. Thanks Carlton and appreciate the heads up on 2.37 in anamorphic. I am thinking of getting the new Sony 4K projector VPLVW600ES. Trust that will work on a 15 foot wide screen for light output. Any specific recommendations for screen gain and brand.. Stewart tends to be quite expensive. Great site Carlton! I’ve referred a number of people to it who have questions about screen sizes/viewing distance, and some who are gung-ho for UHD with screens in the 50-60 inch range. Your chart really helps explain why UHD must be watched up close for much benefit. One of my pet peeves is at least a couple of manufactures are advertising UHD as having four times the “resolution” of HD when UHD is actually only twice HD’s resolution. A few have used words like “four times the clarity” and “four times the quality” which is ok, but being an engineer who specialized in photonics, saying the “resolution” is four times greater really rubs me the wrong way. Your chart makes it easy to show people that there’s only a factor of 2 involved between HD and UHD resolution. How Can I Build a Home Theater in a Small Space? I very much appreciate your advice. Congratulations for this great job. I am planning to replace my 60″ 1080p TV for a 65″ 4K TV. I learned from your points and calculations that the best viewing distance for this 65″ 4K would be 4 feet. The distance that I am currently from the 1080P is 12 feet. Unfortunately I have no way to move the sofa closer to the TV due the particular arrangements of my room. On the other side I am afraid that staying just 4 feet from a 65″ TV I will not be able to see the contents of a film in full – it seems that I would need to be moving my eyes left to right and right to left, which would be extremely annoying. Please let me know what would be the real scenario if I stay 12 feet away from a 65″ 4K TV. At 12′ away from a 65″ TV, you’re better off staying with 1080p. There is no 4k content to watch and you wouldn’t see much improvement even if there were. I read somewhere that with Ultra HD screens the only way to get any significant benefit is to purchase one at least 75″. For typical home seating distances, yes this is true. Please refer to the calculator above. I just ordered a screen research 4k screen, 145 x 81. Throw distance is 21′. Looking for a bright projector that can work with this screen. Its a dedicated theater and the seating is 10′, 16′, 20′. Very interesting reading, i have been doing most things as natural as i can, what i mean to say is that i have tested a 23 inch computer monitor and a 32 inch lcd tv, now, with the 23 inch pc monitor i can sit at my pc desk and watch smalll windowed youtube videos and reading text and general web site viewing at 16 inches from the screen with general comfort. But if i game on the 23 inch monitor i naturally move back in my chair and have measured the distance that i naturally found comfortable viewing and that was 4 feet from the 23 inch (diagoanl) pc monitor, games just looked rough at 2 feet away even maxed out with gtx 780’s in sli. I also tested a 32 inch tv on my pc desk but the picture was even worse and the biggest discomfort was having the large 32 inch tv, simply too big, too in my face. I eneded up hanging the 32 inch tv on a wall at 8 feet away, the view distance was better because i didn’t have this great big huge tv in my face but i still feel as though i am not getting optimum 1080p viewing. Interesting stuff and there is without a doubt something right about lechner’s findings. I can’t find the middle ground so to speak, but it does look like that a 68 inch 1080p screen at around 9 feet away is that distance for optimal viewing comfort and full detail of hdtv. In my case the PC also has this problem, 4k sounds like it could be a visualualy pleasing affair but according to charts or calculations 1 feet from a 4k display would be an absolute horriffic experience. Would I be able to notice a difference between a 23.6″ and a 27″ pc monitor (both 1080p resolution) when my viewing distance is approximately between 3 and 3.3 feet? The two monitors have basically identically performing panels – the only real difference is the size. I’m worried that the pixel density of the 27″ monitor might be too low considering my viewing distance? Should it be possible to notice a difference in pixel density between the two monitors, if they are both viewed at the aforementioned distance? At 23~27″ and 2.5~3ft, you are a perfect candidate for 2560×1440 (detailed computer work for those who crave resolution and copious desktop space), or 1080p = 1920×1080 (for TV/video). Since I am on the road, I have not yet compared my subjective opinion with Carlton’s resolution calculator. It will be interesting to see whether my off-the-cuff, experience-based advice comes in high or low on that scale. Incidentally, if you work from home, 27 inches is a massive display area for any shared environment ,such as a kitchen table guest room desk. Carlton’s resolution calculator concurs with my subjective opinion. It says that at 3ft, you benefit from the 23″ monitor @ 1080p and at 4ft for a 27″ monitor. My suggested resolution of a step higher (2560×1440) applies to critical desktop computing (in which their is little motion and in which you occasionally move your face closer to the screen).